Priscilla Barikisu Larsen (Kisu) is a former instructor at Den Danske Frisørskole (The Danish Hair Academy), a senior hair stylist, and owner of the Barikisu Hair Salon in Copenhagen, Denmark. She is also the owner and head instructor at the Barikisu Hair Academy located in Accra, Ghana. With over 17 years of experience in handling hair from various ethnic backgrounds around the world, Kisu would like to invite interested persons with the desire to learn hair styling techniques of African origin (braids, corn rows, twists, dreadlocks etc.) 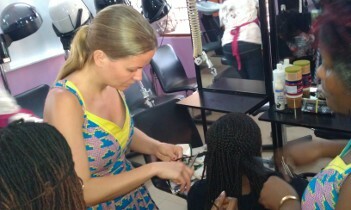 at the Barikisu Hair Academy in Ghana, Western Africa. Enhance your imagination, elevate your creativity, broaden the scope of your capability and gain a competitive edge in the ever evolving salon industry. 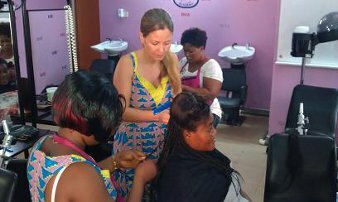 This is an intensive course which introduces students to hair styling techniques of African origin (braids, corn rows, twists, dreadlocks etc.) with the aim of attaining an appreciable level of competence for every participating student. The study period is one month, however, students can choose for a two or three months extended study period. The first batch of students to be registered will begin their studies in January 2012. Durations vary between 2 weeks, 1 month, 2 months and 3 months. Please contact us for course fee information. 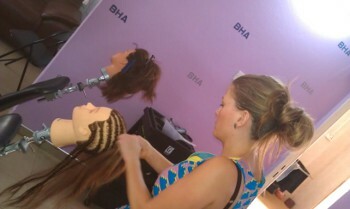 Special deals will be available for the initial courses during January, February and March 2012. The cost of accommodation together with utility charges is €200.00 per person per month. Prospective students should contact Kisu to arrange flight tickets and visa to Ghana.